Alonso and Ferrari remain untouchable in Italy. To F-Duct or not to F-Duct? That was the question everyone scrabbled to answer this weekend. During Friday practice sessions, McLaren split strategies with Button running the F-Duct while Hamilton went without it. That meant that Button would be able to drive more comfortably/reckless around the turns while losing slight time on the straights. Button was on the high-downforce setup for the weekend. For Hamilton (without the F-Duct), that meant he would have the advantage during straight line speed over Button but would also have to tip toe precisely through and over the low speed turns, leaving more of a margin for error. During qualifications Saturday, Hamilton admitted making the wrong decision for not adding the F-Duct to his car for the weekend. It was a no brainer. Ferrari, Redbull Racing, Williams, Renault, Force India, and BMW Sauber also decided to use the F-Duct. Seeing the incredible speed coming from Ferrari on Saturday, it was hard to believe they would be nothing but untouchable on Sunday. Massa topped FP1 as Alonso topped FP2 and 3, grabbing pole position. It was great to see Alonso back in the hunt after all this time and all of his driver error. Massa was overshadowed by his teammate, again. This time it was not forced onto him. Into turn 3, Curva Biassono, two Ferrari’s and two McLaren’s held the first four positions closely. It was to be an exciting and long race. 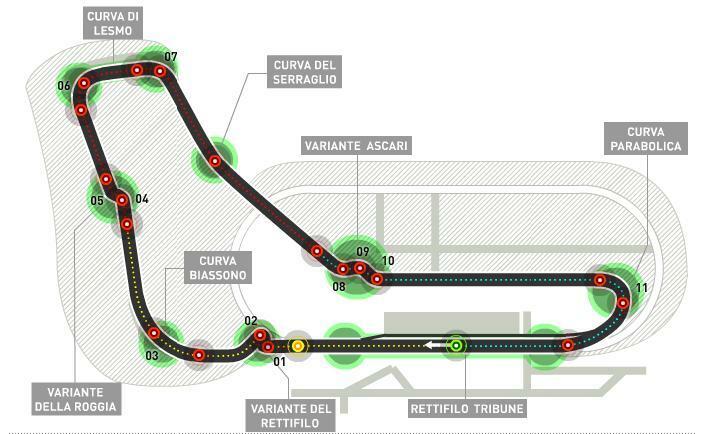 Into turn 4, Variante Della Roggia, the four driver’s desperately squeezed in for the best turning position. Massa did not see Hamilton to his left, as he was focused on Alonso and Button ahead of him. Hamilton got a little too tight into the turn and had nowhere to go after that. Banging into Massa, destroying his front right suspension, left him disqualified. I was surprised Massa suffered no damages. This was the first time a Redbull was off pole. It was the first time nobody really paid any attention to them on Sunday, either. It took a lot for them to pass the competitors in front of them – Webber getting frustrated on Hulkenberg’s tail as he cut the chicane. Webber argued that he was to redeem the position, desperately trying to find a way through. F-Duct? Check. What was it then? Their straight line speed was lacking and they opted to go for a setup focused on tackling the turns more than not. From what I recall, Hulkenberg looked as though he weaved several times trying to keep Webber at bay. The rules state that weaving is allowed – only one defensive maneuver before having to retreat to the racing line. I felt as though Hulk attempted two moves..well, one and a half. Still. For the majority of the race, nothing differed. Both traded fastest laps as Massa occasionally came through, too. An occasional tire locking and over steer communicated that the pressure was getting to both drivers. Ever since he started, Button has been known as the smoothest driver on the F1 grid. He is known for taking turns smoother than any other driver, upping his accuracy rate. For 2010, since the fueling ban, drivers need to take more care of their tires. Alonso was able to distinguish himself from the rest of the drivers as the driver more capable of managing his tires. Compare both of these characteristics and you get a race as close as we saw it. If it weren’t for the pit stops, nothing would have changed. The soft tires held on surprisingly well in Monza. As the race began, I assumed they would be pitting a third of the way in rather than half way through. Ferrari were able to change Alonso’s tires a whole second faster than McLaren on Button. That gave him the edge. In addition, Button came in first: on his outlap, Alonso enjoyed his slightly worn soft tires, which luckily so happened to be faster than Button’s brand new hard tires. Button also suffered from a terrible outlap, cold tires and all. Combine that loss of pace with a superb Ferrari stop and you get overtaken. Both Alonso and Button had run their F-Ducts but Alonso still managed to clock higher top speeds during the race. That must be due to Button’s higher downforce strategy than Alonso. The telemetry showed that Alonso was .400 seconds faster during S1 while Button was .400 seconds faster during S2. S1 has 4 corners while S2 has five corners. There is not much difference in terms of speed, but S1 is slightly better fitting for a lower downforce setup – Alonso. With two laps left, I had my doubts to whether or not Vettel would be pitting. I was sure that if he crossed the line, he would be penalized, or maybe even disqualified – the rules clearly state that a race distance needs to be completed on both types of tire compound. Their strategy adjustment to a problem, his dying engine problem, was fascinating. Their pitstop was spot on and kept him in fourth position, and ahead of his teammate. Alonso and Button are back in the hunt for the championship. Moment of the day: Opening four turns as drivers squeezed through.